It’s not too much to ask for a martini glass that doesn’t want to topple over. However when it comes to barware, long stemmed martini glasses are an accident waiting to happen. (Remember, these things are meant to be filled with booze!) Overcoming tradition is not always an easy thing, but if it means less spilled booze, then perhaps it’s not a bad idea to consider a new design. 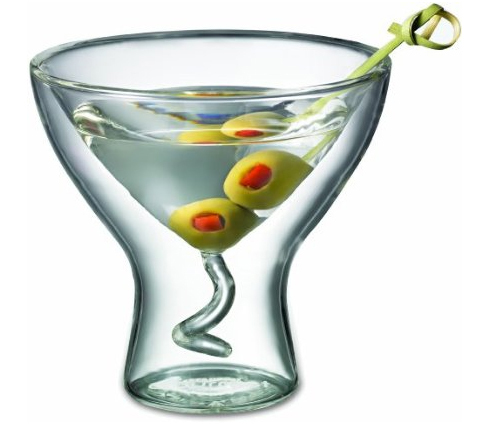 The Starfrit Gourmet 7-Ounce Double Wall Martini Glass provides a stable drinking experience (ahem) by replacing the long stem with a sturdy double-walled trunk. It, of course, won’t eliminate martini-related spillages, but at least it won’t want to topple over when an olive is added to the side.